Simeon Software, an analytics software provider, has appointed Meetoo Media as its Global PR-PR partner. This does not affect its existing relationship with PR firm Able Agency, who currently hold a global multimedia mandate with the software company, responsible for all consumer and corporate messaging. A London investment firm has been incapacitated by an outbreak of friendship. Simeon Partners, an alternative asset management company, alerted the authorities as soon as the infection was detected. It soon became clear that the root of the problem was amongst new members of the Grad scheme. Despite trying to interact exclusively as detached professionals, trainees Peter Finch and Nicholas Ince accidentally got to know one another beyond the usual workplace pleasantries. Given its infectious nature, friendship quickly spread, and soon a number of the graduates began to like each other as people, not merely assessing each other as productivity centers. It wasn’t long before multiple members of Simeon were going out for non-compulsory after-work drinks, and even seeing each other at the weekend. Friends and family were quick to express their concern, with Nick’s girlfriend particularly perturbed. “It just seems weird to me, choosing to spend time with your colleagues when you don’t absolutely have to,” she explained. Simon Hodgson, Managing Partner at Simeon, says that the main issue is that due protocol was not followed. “In the event of a friendship in the workplace, our HR policy requires those involved to communicate it, which did not happen in this case. We were left with no choice”. For the time being, the relevant parties have been quarantined in an attempt to suppress further spread, but Snapchat communication is proving problematic, with the Grads communicating extensively via a range of Emojis. Cryptocurrency is a hot topic right now. While still a relatively new idea, its legitimacy is such that the word has even been added to the Oxford English Dictionary. There are more than 275 different currencies as of May 2014, and Bitcoin first and foremost, with a market cap of more than $6.2B. The fluctuating price of Bitcoin has made it a source of much speculation, with some advocates saying it is here to say, while others are more skeptical. A major point of concern amongst the naysayers is that it’s a bubble, that the currently volatile price may one day fall to nothing. Indeed that was our concern at Simeon Capital when we first considered Bitcoin. However once we dug around, we found a way to guarantee that the price would keep going up and up: Google. As part of our Bitcoin due diligence, we were trying to piece together the key drivers of Bitcoin price. One of our favourite research tools is Google trends, and upon downloading the trend data for Bitcoin, we were astonished to learn that the weekly price of Bitcoin moves almost perfectly with the level of Google interest in Bitcoin. The implications are clear – the more times people Google “Bitcoin”, the higher the price per Bitcoin. 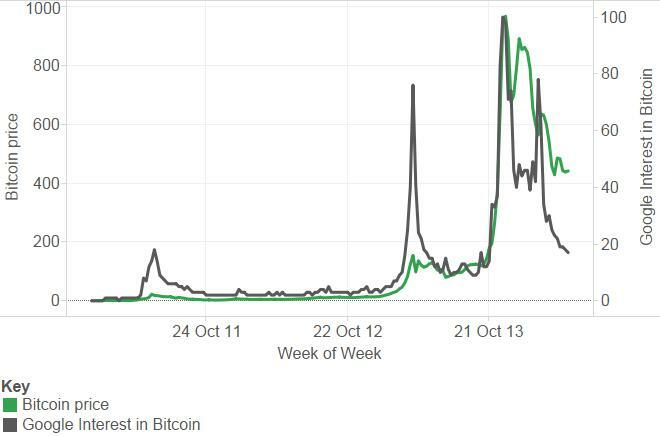 Indeed, according to our proprietary regression analysis, the level of Google interest in Bitcoin is able to explain more than 70% of the weekly price of Bitcoin! Upon seeing this, we of course acted quickly, purchasing millions of dollars of Bitcoin, and walls and walls of computer servers. We are currently in the final stages before the search-launch, when we will effectively triple the number of “Bitcoin” Google searches, which according to our analysis should add an incremental $1000 to the price of Bitcoin in one fell swoop! So buy yourself some Bitcoin, and fire up Firefox. We are long in Bitcoin, and our wealth is only limited by our Googling capability. I’m feeling lucky.